Ever since we started our goal to incorporate more plant-based meals into our weekly menu, I have been buying more and more sweet potatoes. Sweet potatoes are so healthy for since they are packed with betacarotene, the antioxidant that the body converts into vitamin A. Sweet potatoes are also low in calories, high in fiber, and contain folate, vitamins B6, C, and E. I love sweet potatoes because they are so versatile and can be used in everything from soups and stews to dessert. When buying sweet potatoes, it is best to look for medium sized potatoes that feel firm and heavy with a smooth skin. You can store sweet potatoes in a cool, dark spot (about 50 degrees)for up to four weeks. 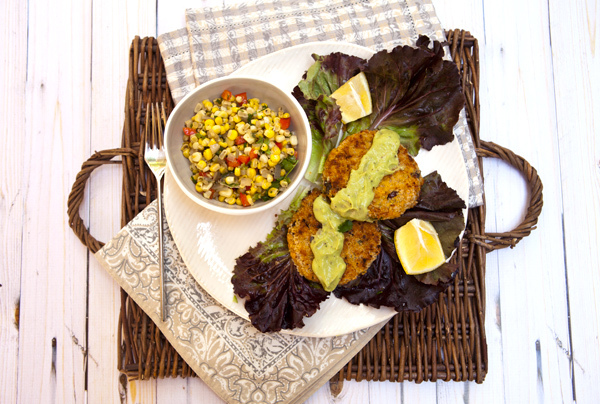 These sweet potato patties have become a weekly staple in my house, and I frequently serve them topped with different toppings and sauces. 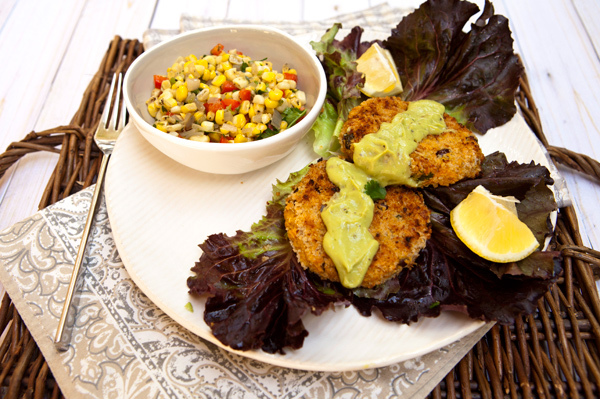 Some of my favorites are Papaya or Mango Salsa or Pico di Gallo, or the creamy avocado sauce I am using in this recipe. 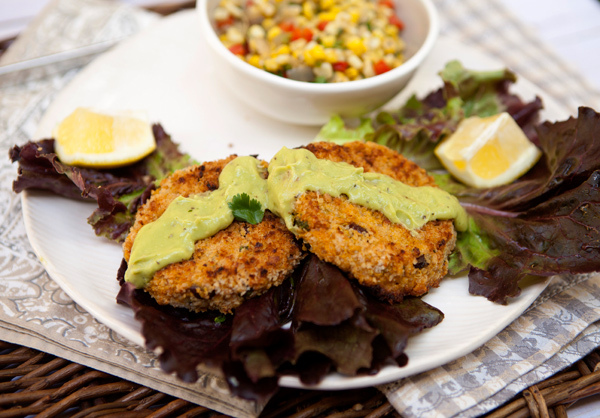 You can add sweet corn to these patties, and replace the black beans with equal amounts of lentils or another variety of bean if you prefer. I often double this recipe as the patties freeze well, and I enjoy them at room temperature the next day as well as hot from the oven. This avocado sauce is delicious, and I use it for many other things including tacos, as a salad dressing, or even drizzled over scrambled eggs with chopped tomatoes. Toss the potatoes with olive oil and place on a foil lined baking sheet. Bake until the potatoes are fork tender, about 20 minutes. Allow the potatoes to cool, then add to a bowl and coarsely mash with a potato masher. Add the quinoa, black beans, onion, cilantro, celery, salt, pepper, cayenne pepper and cumin. Mix with clean hands until the mixture comes together. Form to mixture into uniform sized patties. Cover two baking sheets with aluminum foil and spray well with olive oil spray. Divide the patties between the two trays and spray the tops of the patties with the olive oil spray. Bake the patties for 10 minutes, then carefully flip over and bake another 10 minutes. While the patties are baking, place all the sauce ingredients into a blender and puree until very smooth and creamy. 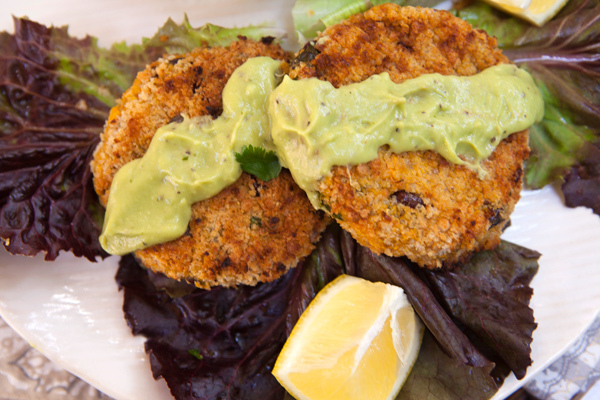 Serve the patties on individual plates, drizzled with the avocado sauce.